As a member of the Social Studies 6-12 Academic Standards Work Group constituted by HB 1490, I’d like to applaud Representative Swan’s recognition of the need for ensuring students in Missouri understand their history and responsibility as American citizens in our republican form of government; and offer a recommendation to achieve a better educated Missouri student without high stakes testing in citizenship. 12 sixty of the one hundred questions correctly. As you are aware, Arizona passed a similar bill, and in fact, a national organization, Campaign for Civic Mission of Schools (CCMS), is promoting similar legislation throughout the country. CCMS is partnered with Pearson, a testing corporation that profits from increased testing in schools. The goal is worthy of your attention, however, you may not be aware of background information that, when explained, will support what should be a substantive, long-term alternative to a potentially expensive, high-stakes test. “Requiring students to pass the citizenship exam will reduce both the amount and the quality of civic education in our schools. The test is easy. You can see all the questions and answers in advance and just memorize the right choices. If passing this exam comes to be seen as adequate preparation for citizenship, schools will notice that their students can pass after cramming for a couple of hours. They will cut their semester-long civics courses as unnecessary preparation. They will prefer to dedicate that semester to math or science, which involve much more sophisticated and challenging tests. (3) Unfortunately, for a variety of reasons, Missourians have been misinformed about their government. When the social studies standards were developed, Marc Tucker’s National Center on Education and the Economy, a Carnegie-funded non-governmental organization in Washington, DC provided consultation. The Show-Me Social Studies Standards (See Appendix A attached) expect students to know that the U.S. is a constitutional democracy. Though familiarity with the U.S. Constitution is included in the body of the social studies standards, even teachers are not familiar with Article IV, Section 4 of the U.S. Constitution that states, “The United States shall guarantee to every State in this Union a Republican Form of Government, . . . ” Thomas Jefferson said, our form of government was a democratical republic — the emphasis being a republic is representative form of government, rather than a democracy. A most disturbing cause for this misinformation and incorrect teaching of American students about American form of government can be traced to the Carnegie-funded publication of the American Historical Association. (See Report of the Commission of Social Studies (see highlighted sections), and Contrarians Chapter 1 attached). Similar misinformation is perpetuated in the College Board’s newly revised AP American History course. (See President of the National Association of Scholars, Peter Wood’s discussion of the misinformation in AP History http://www.nas.org/articles/the_new_ap_history_a_preliminary_reportand http://www.nas.org/articles/update_on_ap_us_history) Again, no state level legislation mandating a 100-question citizenship test will correct the neglect of teaching our children about their history and government in a truthful and meaningful way. Attached is a Thomas B. Fordham Institute report rating Missouri’s Show-Me Social Studies Standards with an F.(see SOSS MO attached) Although the method of review was not rigorous by research-method standards, competent professionals in history reviewing Missouri’s social studies standards gave them a very poor rating indeed. It should be evident that teaching Missouri’s students using high standards for knowledge and skills in history, government, and American citizenship throughout their K-12 education will produce more substantive and lasting competence for participation in America’s exceptional form of government than the test required in the bill. (4) Also of note is that coursework in American history, government, and civics is not expected in the liberal arts education of postsecondary education program. If America is to cultivate well-educated leaders for future service in our government (which is the purpose of publically funded education as per our Missouri Constitution Article IX, Section 1a), state boards of education must ensure that a liberal arts education includes substantive study of the unique history and structure of our American government. (Losing America’s Memory attached). Conclusion: Though HB 578 is well-intended, the requirement to make high school graduation contingent on a test for assessment knowledge of citizenship will not likely achieve the intended goal; and potentially has unknown costs to school districts as students take the test multiple times to get a passing score. 4. postsecondary coursework in American history and government for a liberal arts education of all postsecondary undergraduates. I am pleased to answer any questions you may have regarding my testimony. Thank you for your consideration of this information. 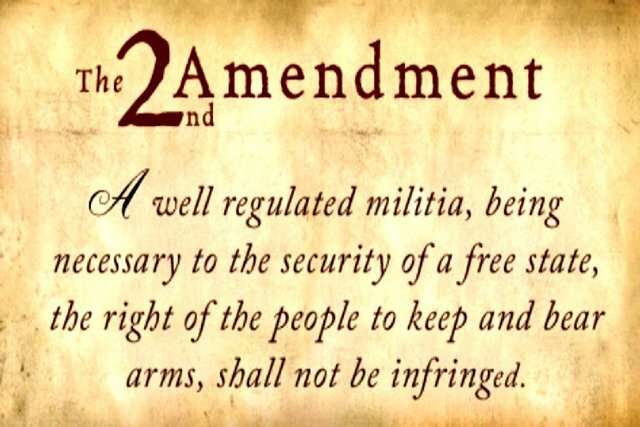 The second amendment has an intriguing history. Various people and judges have given their opinion on what the second amendment precisely means. Intense and fiery debates have divided citizens and political leaders. Why is this amendment so dubious? Some speculate the amendment means that an individual’s right to bear arms is the correct thinking. Others believe it is only for service in a militia. Some believe it is a civil right.